There would be nothing wrong if the Kremlin reverted to the practice of appointing governors in the multi-ethnic republics, according to Alexei Malashenko of the Carnegie Moscow Center. Source: Alexey Kudenko / RIA Novosti. Nine months after popular gubernatorial elections were re-introduced on the initiative of former President Dmitry Medvedev, a 90 percent majority in the Russian Duma votes “yes” on a bill that gives regional legislatures the right to scrap them. President Putin believes the measure could prevent unnecessary conflicts in the Caucasus republics, but critics say the bill marks a step backward for democracy. On Jan. 30 the State Duma almost unanimously backed the first reading of a bill that would allow local legislatures to scrap popular elections of governors. Gubernatorial elections were abolished in 2005, but they were recently restored in April 2012 as part of the package of laws that liberalized the political system. The laws were passed in the wake of mass protests that took place in Moscow and other Russian cities “for fair elections” in late 2011 and early 2012. The initiative to revise the law was put forward by a group of United Russia deputies in December 2012, later receiving the support of President Vladimir Putin. His main argument in favor of the alternative scheme was that popular gubernatorial elections could upset the uneasy inter-ethnic peace in the multi-ethnic Caucasus republics. Under the law, if a regional parliament decided to forgo direct elections, every parliamentary party would have to submit to the president at least three candidates for governor. From amongst these nominees the president would pick three candidates and send them back to the regional parliament, which would select the governor of the region. 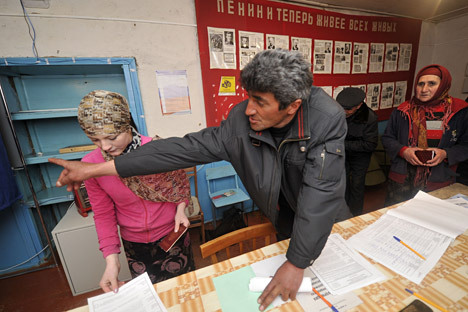 Commenting on the proposed law, the head of United Russia in the State Duma, Vladimir Vasilyev, explained that people in the national republics often vote on ethnic lines or for “their kin,” whereas the members of other nationalities that are the second or third most numerous ethnic groups also claim the right to nominate their candidates for the region’s top job. This is why, in some Russian regions, there is a de facto tradition involving several key posts in the republic being held by members of different ethnic groups. On the eve of the debates on the bill, the head of the North Caucasus Republic of Ingushetia, Yunus-Bek Yevkurov, spoke in favor of the right to renounce direct elections of regional governors. “The president’s administration would never appoint a good-for-nothing who will work sloppily. There'd be nothing to gain from doing so,” said Yevkurov. Alexei Malashenko of the Carnegie Moscow Center believes that the federal center should not treat all the Caucasus regions in the same way. “There needs to be a case-by-case approach to every republic. For example, there would be nothing wrong if the Kremlin reverted to the practice of appointing governors in the multi-ethnic republics (Dagestan, Kabardino-Balkaria and Karachay-Circassia); this is better than ethnic strife. But mono-ethnic republics, including Ingushetia and Chechnya, could easily have normal democratic elections,” Malashenko says. During the course of the debates on the bill, Alexei Didenko of the Liberal Democratic Party of Russia (LDPR) argued that the residents of the regions whose legislatures would decide to abolish popular gubernatorial elections would effectively be declared second-rate citizens. Vice chancellor of the Plekhanov Russian Economics University and member of the Public Chamber, Sergey Markov, compares the bill with travel insurance that people take out but do not expect ever to use. “Such insurance may be very helpful at a critical moment. The chance to choose a different model ensures against destabilization at a time when such destabilization may become very real,” says Markov. Vladimir Pligin, United Russia chairman of the State Duma Constitutional Legislation and State Development Committee, says that, if adopted, the law could be used as early as the Single Voting Day this upcoming September. Based on materials from Interfax, Rosbalt, Gazeta.ru, Vzglyad, Izvestia, Kommersant, Moskovsky Komsomolets.